Residential Conferences are an integral part of the Saybrook University School of Mind-Body Medicine experiential learning model. The RC’s are a meaningful place for students to connect with the Mind-Body Medicine community and dive deeper into their coursework. The January 2013 RC in San Diego included two courses, Intermediate Hypnosis MBM 5625 and Coaching for Health and Wellness MBM 5630, and two optional programs, Authentic Leadership: Leading from Within and a Research Seminar. Terri Goslin-Jones PhD, a mentor at Saybrook, facilitated the Authentic Leadership seminar. During this seminar the participants used creativity, appreciative inquiry, and “witnessing” to create a leadership vision for themselves. 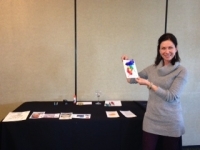 Each participant created a poster or small cards by using magazine photos, yarn, color, and anything that was meaningful for them to represent their exploration towards leading from within. In addition, the group explored Appreciative Inquiry, which uses powerful questions and focused listening to gain a deeper understanding of oneself and another person. Below are some reflections from students who attended the seminar. Students also had the opportunity to attend a research seminar. Many of the tools and presentations from the seminar are available on the MBM Research Resources course shell. Please be sure to review these valuable tools for research and writing that Connie Corley, PhD, Director of Research, posted on the course shell. If you are approaching the research phase of your academic journey, or you are unsure of which research method fits your topic, consider the following reflections from students who attended the Research Seminar.